Wouldn’t it be great if we worked for love? Right now, work is transactional. Most of us go to work not to do what we love, but to earn the money that helps us do what we really love. This is why people talk about “working to live and not living to work.” Which makes sense, don’t get me wrong — until you remind yourself that we spend half our waking hours, or more, on the job. Why on earth are we willing to throw half of our lives away? Shouldn’t we demand more? What would that look like? Imagine a world in which work was for love. 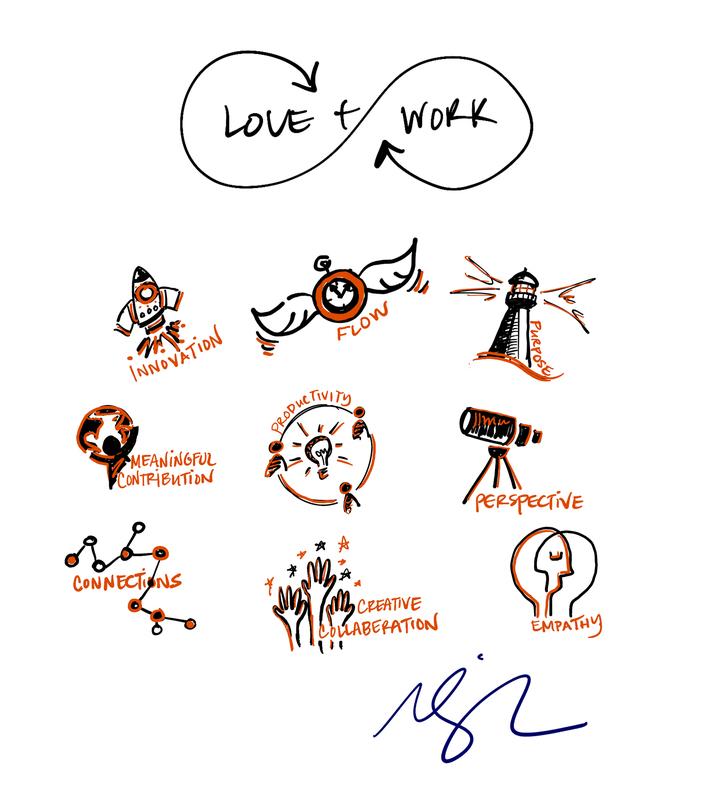 #LOVEandWORK Click To TweetImagine a world in which work was for love. The point of work would be to discover what you love to do — which weird and wonderful things you love that maybe other people don’t. And then, to discover what other people love, too, and how you can use your wonderful differences to do great things together. Would that lead to a more affluent society? Maybe. But it would certainly lead to more innovation, creativity, and productivity in our companies. And more importantly, it would lead to a more prolific, constructive, and forgiving world. We would learn to define ourselves by how unique everyone’s loves are. We would create a society in which people realized that the differences that matter are not those between peoples but those between individual people. And we would all get a lot better at discovering what we love to do and offering it up to the world. Marcus Buckingham is a brilliant author and speaker, whose scientific proactive to human performance has already been transformational. I can’t wait to learn more about his latest material, Stand Out! Our organization recently was lucky enough to host him for a keynote address and I rushed up to him afterwards, asking for his autograph, even giving him the wrong spelling of my name (I was so excited). Seriously take a look at First Break All The Rules, if you haven’t already, and you’re interested in the science behind the effectiveness of great managers. Big step forward Marcus, I am happy to stand beside you with this fresh and innovative approach to work. I recall buying FBATR and knew immediately that I was on your bus. Since then your approach has helped shaped my business and business life, GMP was another game changer. Any sign of a visit to Florida in your plans? Marcus you changed my life!